Camden New Journal - News: Going nuts for christmas cracker! Going nuts for christmas cracker! IT’S hard to think what wasn’t featured in the Hawley Infant School’s nativity play. 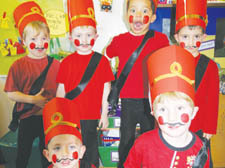 Tin soldiers, Russian dancers, fairy ballerinas, wiggling flowers and a troupe of mischievous-looking rats were just a few of the often overlooked social groups to play their part in The Nutcracker at the Camden Town school. Children rehearsed every day for three weeks before wowing their audience. Funds raised from the production will go to the Thomas House charity.